The Joseph Eye Hospital food services department provides food to the different category of customers who use the product prepared in the facility e.g. Patients, staff, visitors and students. All the meal are freshly made daily in an environment which maintains a high standard of hygiene which follow good manufacturing programmes based on the FSSAI guidelines. 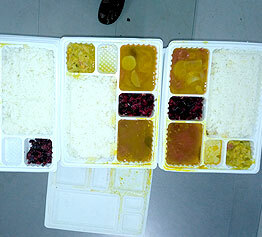 Patients in the hospital are served three meals per day and also provided with appropriate snacks in between the three meals. Patient specific diet, for patients suffering from diabetes, renal problems and hypertension. Different menus are provided to patients to fill in their requirements and to choose from the various delicacies provided in the menus.